A team of researchers has devised a way to measure the internal properties of stars -- a method that offers more accurate assessments of their orbiting planets. The researchers examined HD 52265 and a single planet in the star's orbit. 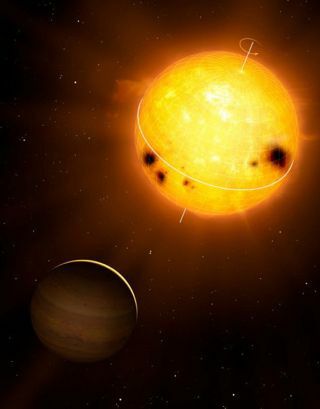 This is an artistic rendering of HD 52265 and its orbiting Jupiter-like planet. By analyzing sonic vibrations in a distant sunlike star, astronomers might have calculated exactly how fast the star spins and how much a nearby giant alien planet weighs. Stars, including the sun, experience sound waves that zip around inside them and cause tiny rhythmic fluctuations in their brightness. By studying these variations, scientists can better understand the interiors of stars— an emerging scientific field known as asteroseismology that is akin to seismology on Earth, which helps geologists yield insights into the innards of this planet. Repeated wobbles in the movements of HD 52265 suggested a giant planet's gravitational pull was tugging on it, which astronomers dubbed HD 52265b. The magnitude of the wobbles suggested the planet had a mass at least 1.09 times that of Jupiter — scientists could not give a more precise figure based on the wobbles alone. The oscillations in brightness that the researchers investigated are linked to ripples in that star that are, in turn, based in part on its rate of rotation. The scientists calculated HD 52265's interior completes a revolution every 12 days, meaning it revolves some 2.3 times faster than the sun. "Knowing the rotation of stars is important to understand stellar activity cycles," said Laurent Gizon, an astrophysicist at the Max Planck Institute for Solar System Research in Germany and the study's lead author. "Magnetic fields in stars like the sun are maintained by rotation and convection." Discovering the manner in which the star HD 52265 rotates also provides clues about how the planet HD 52265b is oriented toward it, assuming the star's equator is lined up with the planet's, as is typically the case in Earth's solar system. When these data are combined with the information about the magnitude of the wobbles the planet exerts on its star, the mass of world is about 1.85 times the mass of Jupiter, the researchers calculated. "Asteroseismology is a very powerful technique to fully characterize exoplanets," Gizon said. In the future, the European Space Agency's PLATO mission could use asteroseismology to analyze a multitude of stars and planets. "The decision on the selection of the mission is expected at the beginning of 2014," Gizon said. The scientists detailed their findings online July 29 in the journal Proceedings of the National Academy.